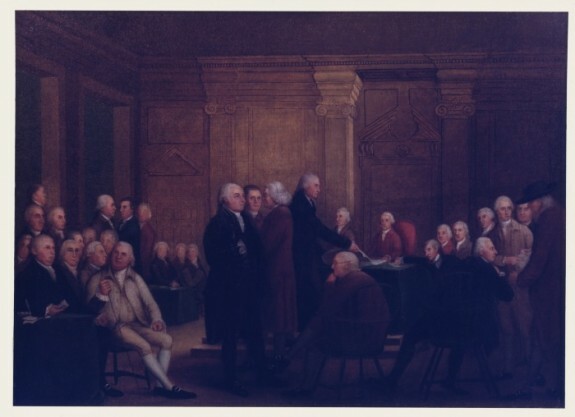 This painting by Edward Savage is the most accurate known depiction of the interior of the Pennsylvania State House at the time of the Declaration of Independence. It is a recreation of the event, painted after the fact in the late 1780s or early 1790s. But it is believed to be based on an earlier work by Robert Edge Pine, who occupied the same room as his art studio in the early 1780s. 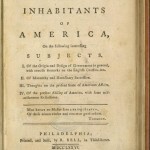 Common Sense, by Thomas Paine, was published in Philadelphia and generated popular support for independence. 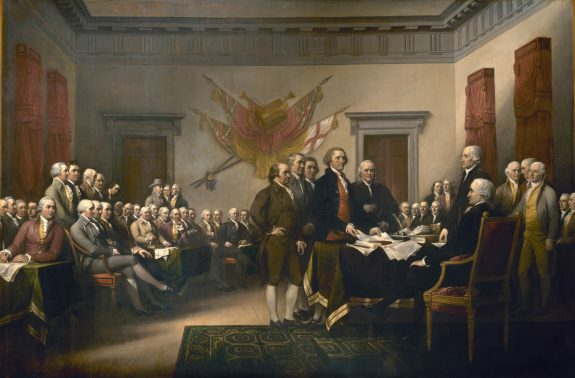 John Trumbull painted the Declaration of Independence in 1819 as an enlargement of a smaller painting originally completed in 1786. In the painting commissioned by the U.S. Congress to be hung in the Capitol Rotunda, John Hancock sits at the desk, flanked by Charles Thompson. Thomas Jefferson and Benjamin Franklin present the draft with the support of John Adams, Roger Sherman, and Robert Livingston directly behind them. Both by intention and by accident, this painting is not entirely historically accurate. Trumbull's intention was to preserve an image of the Founding Fathers, which resulted in the inclusion of some patriots who were not in attendance. Additionally, he omitted the founders for whom no portrait could be found to be copied. Jefferson provided the sketch for the room in the Pennsylvania State House (Independence Hall), but it was from memory and not accurate. Trumbull, by turn, took creative liberties, choosing to add the British drum and flags from his own imagination. Furthermore, Trumbull chose to add fancier furniture, including the draperies, essentially giving the room a more elegant feel. In later years, this iconic image appeared in a wide variety of places, including a set of bicentennial stamps in 1976 and $100 National Bank Note in 1863. It can be found commonly on the backs of $2 bills. 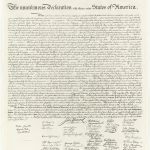 The Declaration of Independence was originally published in many different forms. The earliest version is the printed Dunlap broadside, named after Philadelphia printer John Dunlap who organized the production of it and dispatched the copies widely throughout the colonies to spread the word of independence. 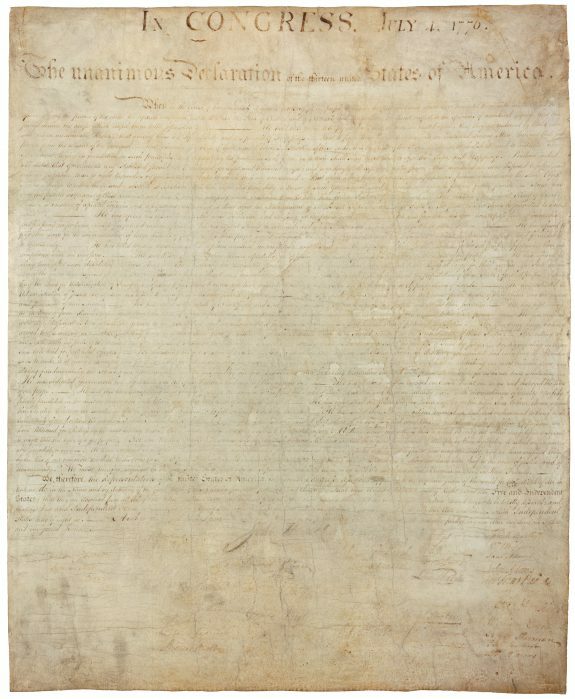 However, the most well-known copy is the engrossed copy on parchment pictured here which was assigned by the majority of the signers on August 2, 1776. Timothy Matlack is commonly thought to be the delegate who penned the engrossed copy of the Declaration. Historians suspect that the engrossed copy of the Declaration of Independence was originally rolled up to be stored, which was typical of parchment document storage at that time. Over time, however, the actions unrolling and re-rolling would have damaged the parchment and the ink. Additionally, another theory is that the use of copy presses hastened deterioration of the ink. Copy pressing involved pressing a damp piece of paper against a document to be copied and then pressing until the intended information transferred onto the blank paper, thus making it possible to create additional copies. In the early years of the United States, the Declaration moved around frequently, periodically following Congress. From 1841 to 1876, it was displayed in the Patent Office, where it was directly exposed to sunlight and not kept in a climate controlled space. In 1920, a concerted effort was made to preserve the quality of the document by creating a committee to evaluate the current storage system. It was then given to the Library of Congress with a brief sojourn to Fort Knox during World War II for safe-keeping. In 1952, the Declaration was given to the National Archives. Originally commissioned by John Quincy Adams around 1820, this engraving was completed by William Stone in 1823 on copperplate. Stone never described the methods that he used to produce the engraving, but it's possible that he traced the Declaration (either by hand or using a device designed for that purpose) or by using a method known as copy press, in which the original was damped and then pressed against a blank paper to transfer an ink imprint. One distinctive feature of this engraving is that it is 24 by 30 inches, or approximately the same size as the original. On the 1823 printing the words “Engraved by W.I. STONE for the Dept. of State by order/ of J.Q. ADAMS Secy of State July 4th 1823” were printed at the top. In subsequent printings, the line was removed and the words “ W.J. STONE SC. WASHŅ” were added below the first column of three signatures on the left. After completing the engraving in June 1823, Stone sold it to the State Department, which then commissioned 200 copies printed on parchment. These copies were then allocated to varying important officials and departments, including the surviving signers of the Declaration. Close to 200 years after the printing, only around three dozen of the 200 prints had been found. The top of the print features personifications of liberty and justice book-ending the American eagle. Along the borders of the picture are the state seals of the original thirteen colonies, In the bottom center is a depiction of the White House at the Capitol in Washington D.C. Under the bottom left border in light print are the words “Ornamentation by A.M. Wray & Engraved by E. McCabe.” Under the bottom right border in a parallel position are the words “Engraved by J.W. Allen.” This print is approximately 13.5 x 10.25 inches. 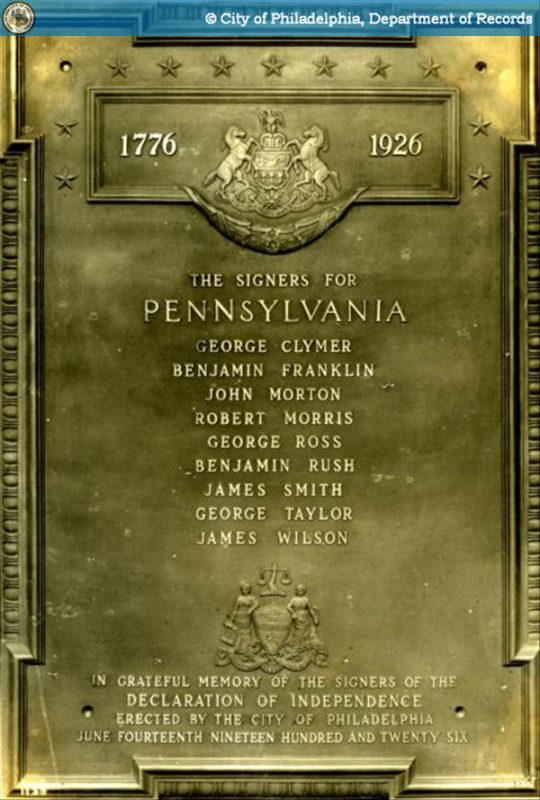 In 1926, the city of Philadelphia dedicated a tablet in memory of the signers of the Declaration of Independence. 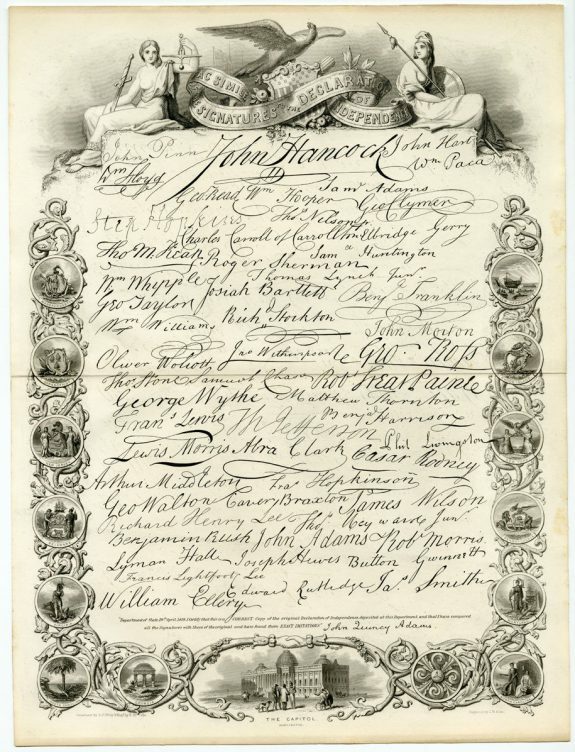 As pictured above, the signers included George Clymer, Benjamin Franklin, John Morton, Robert Morris, George Ross, Benjamin Rush, James Smith, George Taylor, and James Wilson. Convening in the East Room of the Pennsylvania State House from May 1775 to July 1776, sixty-five delegates of the Second Continental Congress worked through deep political divisions to create the Declaration of Independence, which gave birth to a new nation and cemented Philadelphia’s reputation as a Cradle of Liberty. When the Second Continental Congress assembled in Philadelphia in May 1775, the shooting war between British and colonial forces was underway and the delegates faced the task of funding and arming a Continental army, appointing its leadership, and managing a war against its powerful foe. But what about the issue of independence? Even though the war had begun with the Battle of Lexington and Concord in Massachusetts a month before, on April 19, 1775, a formal political separation from the British crown was not a foregone conclusion. Even in January 1776, a scant six months before the independence was declared, many of the delegates thought that reconciliation with the Crown was the most prudent course of action. On January 9, 1776, Pennsylvania delegate James Wilson (1742-1798) proposed that Congress reject any talk of independence. That same day, the printing shop of Robert Bell near Third and Walnut Streets issued a pamphlet that magnified the desire for independence. 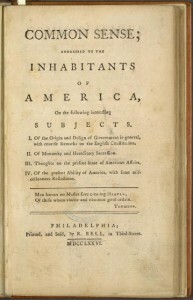 Thomas Paine’s Common Sense, with its rejection of monarchy as a form of government and its impassioned pleas for independence from Great Britain, electrified not only Philadelphia but the thirteen colonies as a whole. 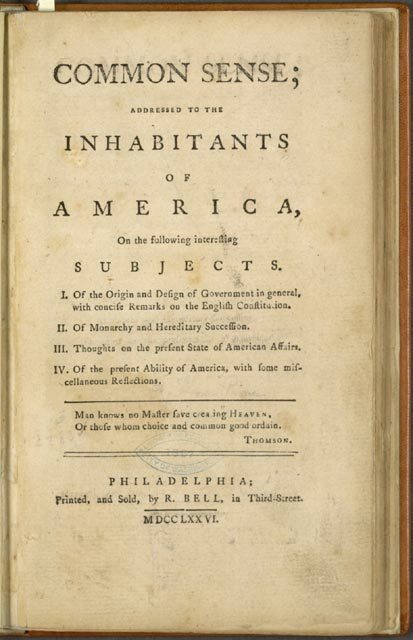 While the Continental Congress continued to deliberate, the pamphlet caught fire outside of the elite ranks of colonial America, selling nearly 500,000 copies in its first year of publication. 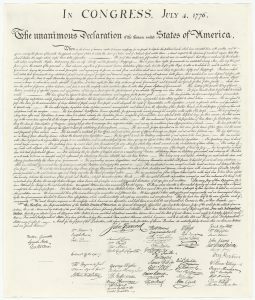 Between April and July 1776, a groundswell towards independence also emerged in the form of more than ninety local declarations of independence adopted around the colonies. These included resolutions by militia companies in Philadelphia, Chester County, and Lancaster County, Pennsylvania. 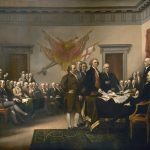 The colonial governments of Delaware, New Jersey, and Pennsylvania did not share in the growing enthusiasm for independence. 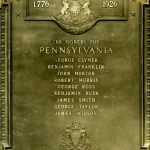 On May 1, 1776, voters in Pennsylvania elected a new provincial assembly that favored reconciliation. Due to its political and economic influence, Pennsylvania held a great deal of sway over the other colonies. Delaware instructed its delegates to the Continental Congress to “concur” with other delegates but avoided the word “independence.” Virginia, however, moved in the opposite direction and on May 15, 1776, instructed its delegation to declare independence. A new Provincial Congress formed in New Jersey also changed positions, placing the Royal Governor William Franklin (1730-1813), the son of Benjamin, under arrest and sending a new delegation to Philadelphia with instructions to declare independence. On June 7, Virginia delegate Richard Henry Lee (1732-1794) formally presented a plan for the colonies to declare independence, create a national government, and enlist the aid of foreign nations in the war effort. The motion was seconded by John Adams (1735-1826), but political resistance to independence was still deep in the Congress. In Pennsylvania’s case, the provincial Assembly meeting upstairs in the State House remained committed to reconciliation. 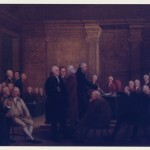 With passage uncertain, the Continental Congress voted only to resume debate on Lee’s resolution on July 1, 1776. While those in favor of independence worked behind the scenes to win the votes needed for passage, a committee of five delegates—Adams, Benjamin Franklin (1706-1790), Roger Sherman (1721-1793) of Connecticut, Robert R. Livingston (1746-1813) of New York, and Thomas Jefferson (1743-1826) of Virginia—set to work on the declaration itself. To complete this most important of tasks, Jefferson moved away from the activity surrounding the State House to the quieter outskirts of the city, at Seventh and Market Streets. Working in rented space on the second floor of the home of bricklayer Jacob Graff, Jefferson completed his draft in roughly two weeks. After some minor editing and suggestions from Franklin and Adams, the document was presented to the Congress on June 28, 1776, for further editing and debate. 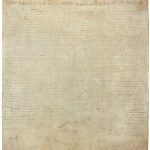 The Congress made more than ninety changes to Jefferson’s draft, from changes in vocabulary and sentence structure to the elimination of some Jefferson’s listed grievances against the King. These changes included removing the charge that King George III had delivered the “un-Christian” practice of slavery to American colonies. On July 1, after a long day of debate, the Congress voted. Each colony had one vote, requiring the delegations to decide among themselves how to cast their single vote. Pennsylvania and South Carolina voted no; New York—whose provincial government was then fleeing the invading British Army—abstained. Delaware’s two delegates were split. Although a majority of the delegations at this moment voted in favor of the resolution, proponents of independence sought unanimous support. On July 2, the remaining pieces fell into place. South Carolina reversed course and voted in favor of Lee’s resolution. Delaware’s Caesar Rodney (1728-1784), in an act memorialized in 1999 on Delaware’s commemorative state quarter, rode through the night to arrive at the State House to break his delegation’s tie in favor of independence. Within the Pennsylvania delegation, John Dickinson (1732-1808) and Robert Morris (1734-1806), both opponents of independence, abstained, leaving Pennsylvania’s delegation 3-to-2 in favor of independence. Dickinson, recognizing the symbolic importance of a unanimous decision, did not cast his vote. Realizing he could no longer stay in Congress, Dickinson left and volunteered for the Pennsylvania militia. The Congress voted unanimously in favor of independence. Some of the delegates—Adams most famously—considered July 2 as the day of American independence. It was July 4, however, when the final editing and wording of the document was approved and sent to Philadelphia printer John Dunlap (1747-1812) at his shop at Second and Market Streets for publication. Philadelphians first heard the document on July 8, when John Nixon (1733-1808), a Lieutenant Colonel in the Philadelphia militia, read the Declaration of Independence in the State House Yard. The public reaction was passionate and widespread. According to historian William Hogeland, the crowd shouted “God bless the free states of North America!” three times. In the ultimate act of defiance, Pennsylvania militiamen removed the king’s coat of arms from the State House and threw it into a large bonfire. Thousands of visitors each year visit the Pennsylvania State House, situated then as now on Chestnut Street between Fifth and Sixth Streets. They may not be aware of its history as a State House or that the Georgian style of its architecture expresses deep ties between Pennsylvania and British culture. These visitors are drawn by the significance of this building in the early history of this nation, and know it better by the name it gained from the events of 1776—Independence Hall. Hogeland, William. 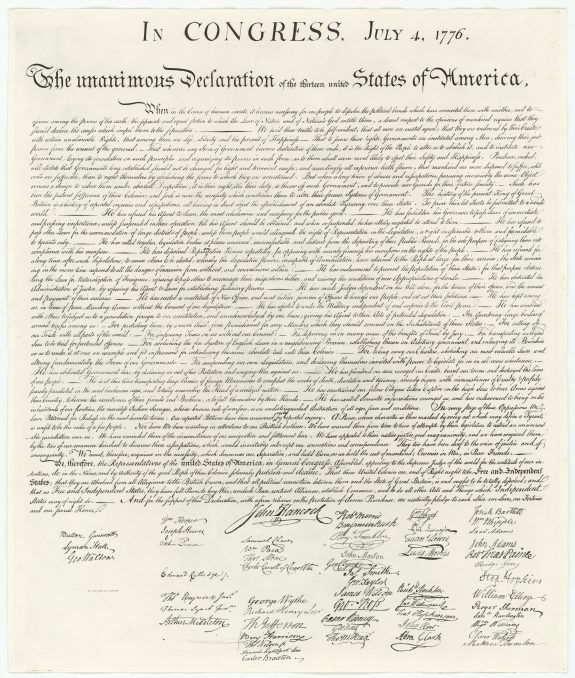 Declaration: The Nine Tumultuous Weeks When American Became Independent, May 1-July 4, 1776. New York: Simon and Schuster, 2010. Tinkcom, Harry M. “The Revolutionary City, 1765-1783.” In Russell F. Weigley, ed. Philadelphia: A 300 Year History. New York: W.W. Norton and Company, 1982. Tsesis, Alexander. For Liberty and Equality: The Life and Times of the Declaration of Independence. New York: Oxford University Press, 2012. Museum Collection, Independence National Historical Park, Third and Walnut Streets, Philadelphia. Papers of Benjamin Franklin in Philadelphia and other repositories (Biographical Directory of the United States Congress). Papers of John Dickinson in Philadelphia and other repositories (Biographical Directory of the United States Congress). 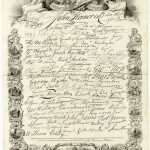 Papers of Robert Morris in Philadelphia and other repositories (Biographical Directory of the United States Congress). Papers of Thomas Jefferson in Philadelphia and other repositories (Biographical Directory of the United States Congress). Common Sense Historical Marker, Third Street and Thomas Paine Place (Chancellor Street), Philadelphia. Declaration House, 701 Market Street, Philadelphia.